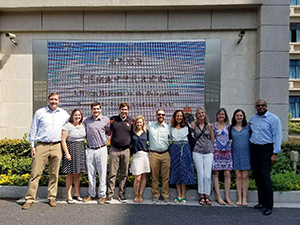 LFA faculty will be traveling around China for the next week and will visit the cities of Shanghai, Beijing, and Taiyuan! Read about their trip below. We said “Pingyao see you again” at 5:45am and began our bittersweet journey home. Thinking of the trip as completing just “7 legs” instead of 30+ hours made it easier to wrap our heads around the travel on this summer solstice. 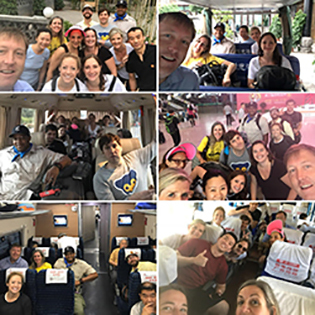 Since it was ‘National Selfie Day’ we did our best to take a group selfie on every leg of our journey. 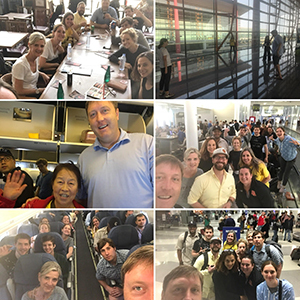 We passed time in the Beijing airport having a late lunch, playing a Chinese version of hacky sack, and making new friends on the long flight up over the Bering Strait and back to North America. Our last flight was delayed but we all made it back safely. Special shout out to Adam Gerber for braving the worst O’Hare traffic I have ever seen to pick our group up and take us back to campus. We are smelly and tired, but our hearts are full. This trip has been such an incredible experience. We have learned so much about Chinese culture, our students, and ourselves. Thank you to all who made the trip possible, we are so grateful! The day started out very early. It was a 6:30 departure from the hotel. We arrived at the train station in Beijing with plenty of time. Maxwell led us all the way onto the train and said goodbye. It was a smooth 2.5 hour train ride to Taiyuan. We arrived at our very cool hotel, had a nice lunch including zongzi. The legend of zongzi states that the villagers threw zongzi into the river so the fish wouldn’t eat the famous poet, Quyuan, who jumped into the river to escape danger. 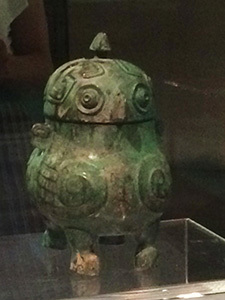 The first museum was a beautiful Chinese history museum. We examined Chinese history from the Paleolithic through the Qing Dynasty. Many of the beautiful artifacts were made of bronze. The most popular was this owl. 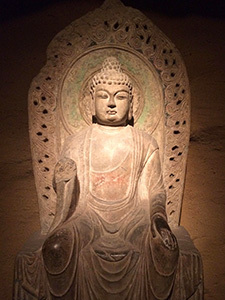 We also saw some fantastic Buddhist artifacts that many of the teachers took photos of to use in class. Many of the museum visitors asked to take photos with us and we gladly obliged. The next stop was a coal museum. We learned fascinating facts about all of the 14 different types of coal and the different regions where coal is mined in China. 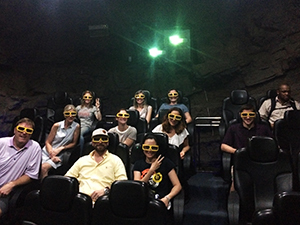 One of the highlights was a true 4-d experience. The other highlight was a ride on the coal mine express. We ended the long day back where we had lunch and had a tremendous meal with many new items including a delicious soup and succulent lamb skewers. And that is all for this evening. Tomorrow, we are off to an ancient city where we will stay for 2 nights! 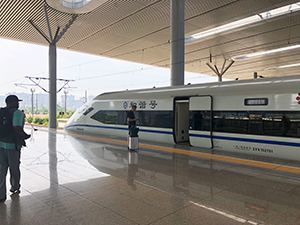 On Friday morning, the LFA contingent headed to Shanghai Hongqiao Railway Station to catch the bullet train to Beijing. 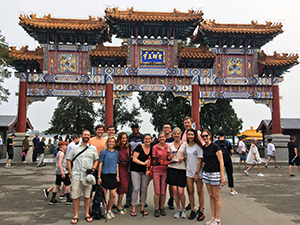 4 hours and 700 miles later the group arrived at Beijingnan Railway station, where we were met by Maxwell Wang ‘17, Simone Lee ‘21 and her mother. 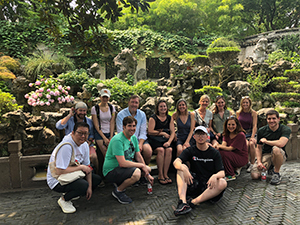 From there, the group took a bus to the Summer Palace in Beijing, where the royal family would spend much of their time in the warmer months. Modeled after West Lake in Hangzhou, the Summer Palace was greatly improved by the Empress Dowager Cixi in the early 1900s. 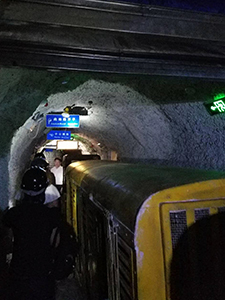 The group walked the Long Corridor (745 meters long with 14,000 paintings), saw the Marble Boat, and walked across the 17-arch bridge. 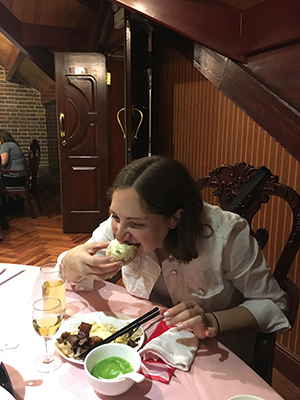 Following that, the group had an amazing dinner at Hua’s Restaurant in the old summer palace, where we ate the signature dish of the city, Peking Duck. To end the day, we checked in at our uber-modern hotel, the W.
We started off today with a visit to the prestigious Shanghai Foreign Language School. They warmly welcomed our delegation from Lake Forest Academy. 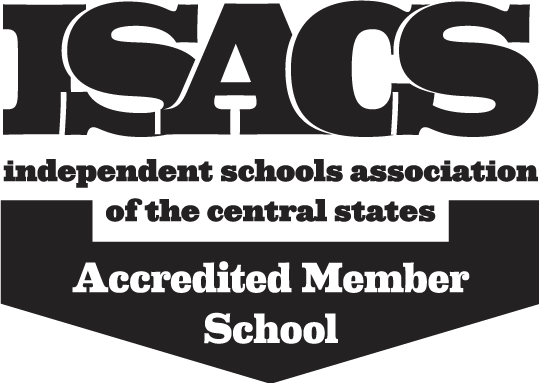 After a presentation about the school, we had the opportunity to meet in small groups with teachers from corresponding disciplines to exchange classroom practices, curriculum, and culture. It was a great experience to learn first-hand about the culture of the Chinese education system. 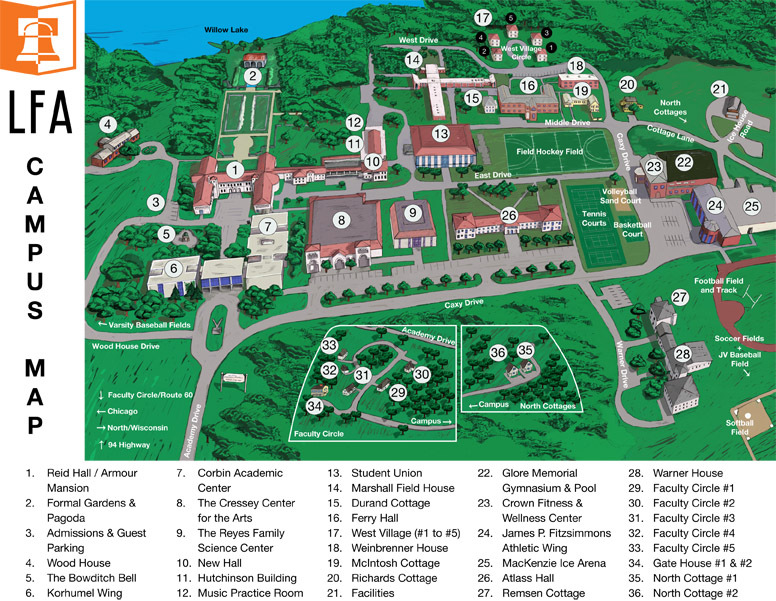 Many teachers found it enlightening to better understand where our Chinese students are coming from. After another amazing lunch at a great seafood restaurant, we had some free time. 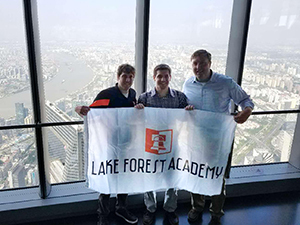 Some of us went to the observation deck at the Shanghai Tower and marveled in the incredible views and functional environmentally conscious design. Others explored more of the local area and markets. The main event this evening was the summer celebration banquet. It was wonderful to see our students again who were so happy to share their love for their home with us. The students put on a great presentation welcoming the new students and congratulating graduates. The seniors made a video to share their favorite LFA memories and give advice to new and current students. It was an unforgettable event and it really felt like everyone in the room was family. Today, the group woke up early to grab a quick breakfast before jumping onto our bus to beat the rush hour traffic to Shanghai Hongyiao Railway Station. There we boarded a bullet train reaching where we reached speeds of 308km/h or about 185 mi/h to Hangzhou. 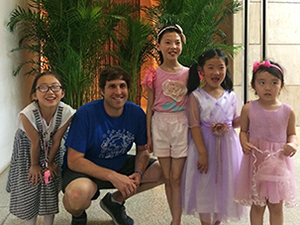 Upon arrival at Hangzhou, a small group broke off with Joy to visit a potential sister school. The rest of the group went with Mr. Wang to meet up with Cindy, our tour guide for the day, and board a bus to the Lingyin Buddhist Temple. 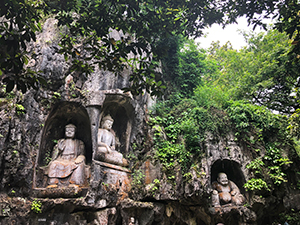 As Cindy explained the history of the temple, the group saw statues carved in the walls of rocky cliffs and viewed a number of statues ranging up to the age of 800 years old! After the temple, we went to lunch at Lou Wai Lou overlooking the West Lake. 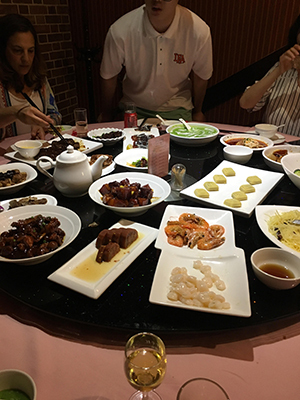 Mr. Wang once again organized a wonderful family style meal with a collection of dishes that represented the culinary style of Hangzhou. Afterwards, both groups converged and boarded a boat where we were treated to tea and a tour of West Lake. 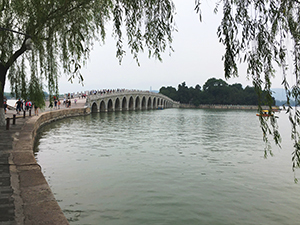 We got to visit an island, take in the views of the city, and hear ancient love stories explaining the names of the many bridges throughout the lake. Then we had a chance to visit the Silk Market for some quick shopping before we went Tang Palace, a Cantonese restaurant. After some eclectic dishes and some good laughs, we had to rush out to catch our train back to Shanghai. We all had just enough energy to say hello to Dr. Strudwick before calling it a night. Another incredible day! This morning we all woke up at various times. 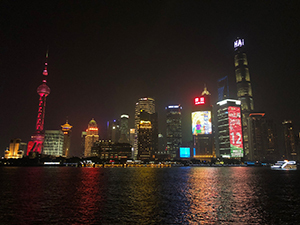 Some of us were able to walk around and explore the city of Shanghai as the sun was beginning to rise. All of us ate breakfast at the hotel. It was a wonderful spread including, but certainly not limited to, poached eggs, sushi, smoked salmon, pastries, fresh fruit, and so much more! We all got on a bus that took us to the Yu Garden. It was a beautiful garden with koi ponds, unique architecture, winding paths and beautiful greenery. Afterwards, we had some time to shop around in the area. Some of the items purchased were jade rollers, post cards, and paper cutting artwork. For lunch, we enjoyed another family style meal with one delicious plate after another making its way to the lazy susan. 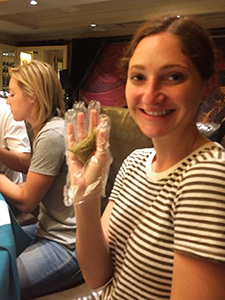 One of the most memorable dishes was the soup dumplings! After lunch, we walked back to the bus which took us to The Bund. While we were able to view the city during the day, we were also able to come back after dinner to see the skyline all lit up at night. The Wang family has been so generous throughout our stay thus far. We have all really enjoyed touring their hometown and are looking forward to visiting Hangzhou tomorrow! The day began early in the morning as we departed from O'Hare at 7 am. After a quick flight we landed in Montreal for a layover before our flight to Shanghai. We had some time to explore the terminal there, which was very state of the art. Those Canadians really know what they are doing! We ate lunch at a spot called Archibald's and toasted Lynn for her birthday. We then embarked on our 14 hour journey over the North Pole to China. Our flight was smooth and surprisingly, not full, some of us even had a free middle seat! Air Canada provided a lovely travel experience, we give them 5 stars. Upon arriving in Shanghai we were met by the large crowds as we went through customs. Joy, Sky Wang and his parents were there to meet us as we exited the terminal. It was so nice to see a familiar face after a long day of travel. Our hotel, the Kunlun Jing An, is in a great neighborhood and the accommodations are wonderful. We walked to the restaurant where we ate dinner and got to take a peek at some of the neighborhood shops and such. For dinner we went to a restaurant called Polo. It is a famous traditional restaurant in Shanghai. Sky's parents ordered an incredible amount of food. Each time we thought the waiter had brought the last dish, another came out, each dish was better than the last! It was a great start to our visit in Shanghai. Now it is off to get some rest before a busy day of sightseeing tomorrow. Enjoy the group pictures and of course, the pictures of food!